You know me, big card maker, not big scrapbooker. 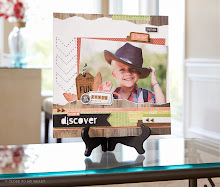 Mini-scrapbooker, yes. Big scrapbooker, not so much (although I'm working on it). I used the My Creations Mix & Mingle Album. The album "pages" are 4"x4" and there are 3 clear and 5 white chipboard pages in die-cut shapes. Very cool! I did my project double-sided, so she could flip it over in 6 months and stare at new pictures! It's hard to tell from the picture what shapes the clear pages are. Some have the bracket edge, some are scalloped. I used a ribbon to hang the whole project. Little rings for hooking the pages together are included with the album. I used the Miracle Paper Pack (current) and Veranda Paper Pack (retired). I think I may have also used some paper from Twitterpated (retired). The absolute BEST way to trim the paper to the shape of your "page" is to use use the Finishing Files. (Love 'em!) You glue the paper onto your "page," trim as close as you can to the "page" with scissors, then use the Finishing Files (like sandpaper) to get in close/soften the edges so they don't look cut. They're like the man-tools files, just smaller. They are perfect for smoothing edges on a page that's weird shaped, like these curves. I hope you will try making a mini-album some day. Call me for guidance if you want. 425.255.3731. I'd love to help.